Trippin’ | how 'bout some cake? If, a year ago, you’d told me that I’d drive 5,000 in road trips in 2012, I wouldn’t have believed you. Alas, I have- and that might be a conservative estimate! 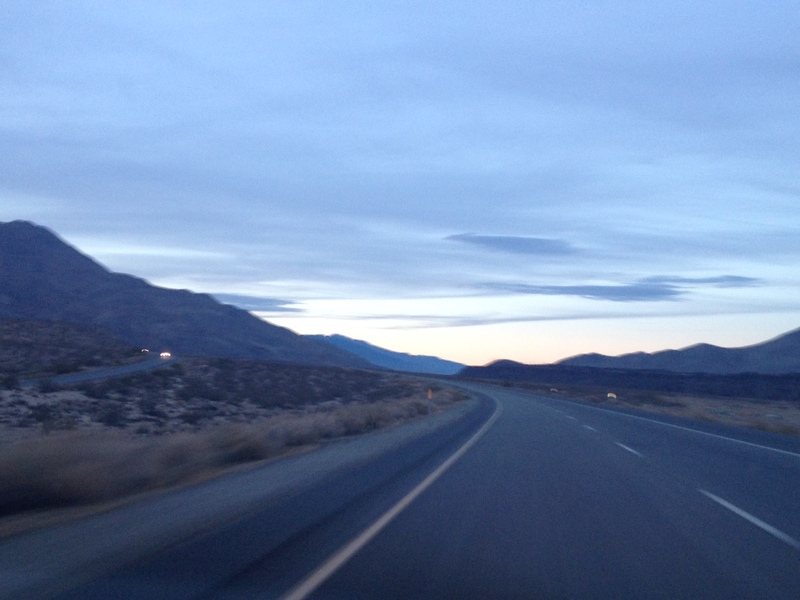 Yesterday we drove allll the way from San Diego to Lake Tahoe- 530 miles. 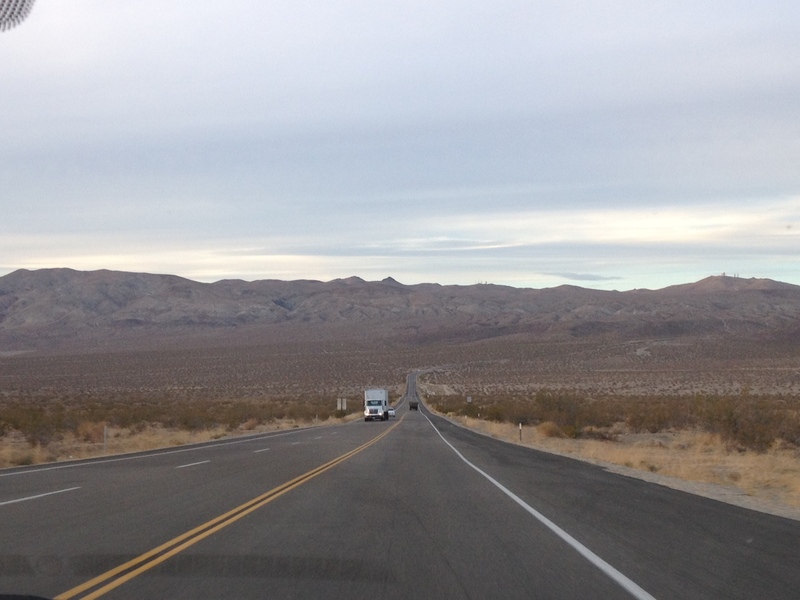 I enjoyed the first half from the passenger seat as we cruised through the California desert and one po-dunk town after another. The sun set around 5:00 and it was my turn to drive. An hour later our tummies were rumbling for dinner. We’d gotten a quick sandwich for lunch and decided on something slightly more enjoyable for dinner. At that point in our journey, we were passing through quaint little Western towns interspersed between long stretches of National Park or desert highway. Each town would have some kitschy motels, a restaurant or two, a general store, and a post office. I think that the town we stopped to eat in was called Big Pine. 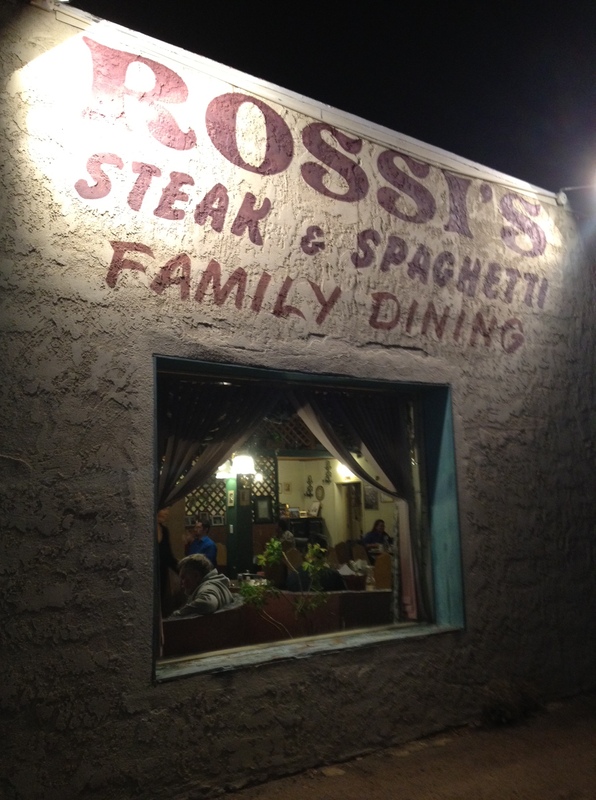 Our dining choices were The Country Kitchen or Rossi’s Steak and Spaghetti. We choose Rossi’s for the charm. Just inside we were greeted by a wall of plaques and accolades. 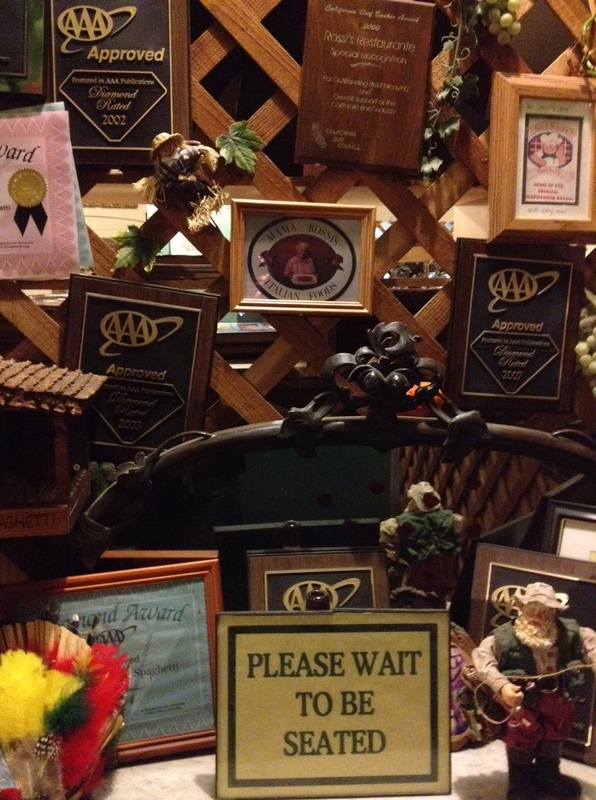 Apparently, they took a lot of pride in their annual AAA approval. A friendly woman with big brown hair sat us in the corner table, which was perfect because it really let me survey the place. “Tonight is lasagna night, but we only have one piece left,” she warned us before turning and leaving. There was fake foliage climbing garden lattice, burnt out light bulbs, and vinyl table cloths (but white linen napkins). It wasn’t our usually dinner scene. This is going to be a treat, I thought. My iPhone hated the lighting, but this place was too great, I HAD to share it with you. It turned out that the woman who sat us wore every hat except chef. A few minutes later she brought us a carafe of water and notified us that the last piece of lasagna had been spoken for. Jason’s face fell- I could tell he really wanted that lasagna! Instead he ordered chicken breast and a baked potato. 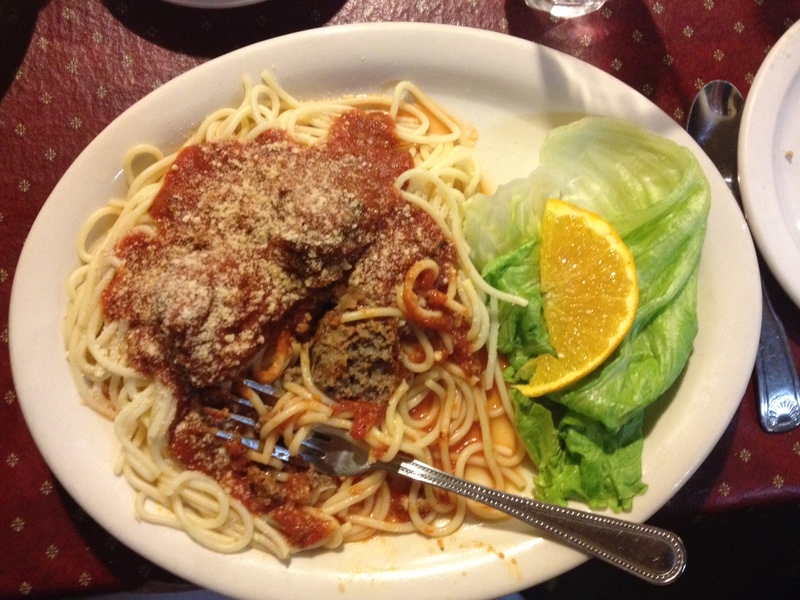 I opted for spaghetti and meatballs. She hustled off to the kitchen to put the order in and I continued to peruse the decor. I’d originally thought it was hilariously tacky, a real little gem on this long adventure of ours. The more I soaked it in though, the more I really began to love it. This was clearly a place that had been in the family for generations, and I could tell how proud they were of it and the little town it called home. 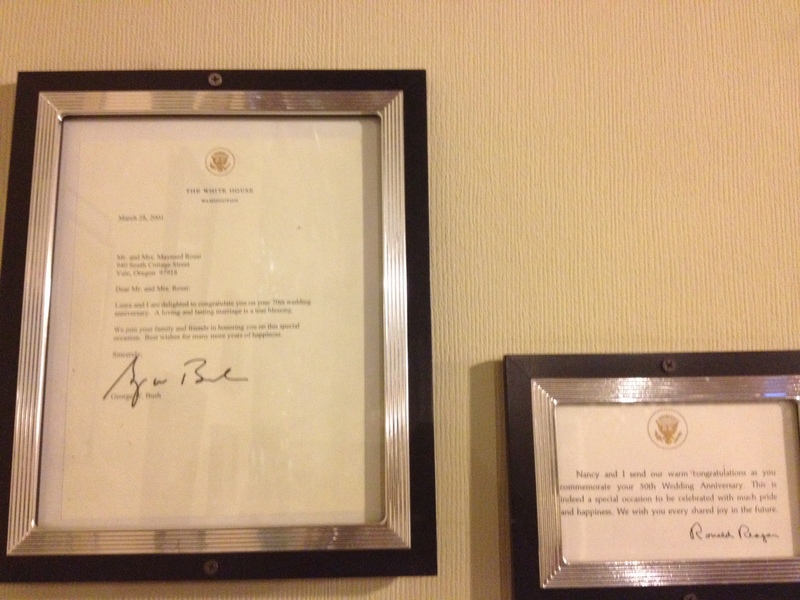 Seen here (right above our table) are a letter from Ronald Regan congratulating the Rossi couple on their 50th wedding anniversary. Next it was one from George Bush congratulating them on their 70th! It warmed the cockles of my heart. 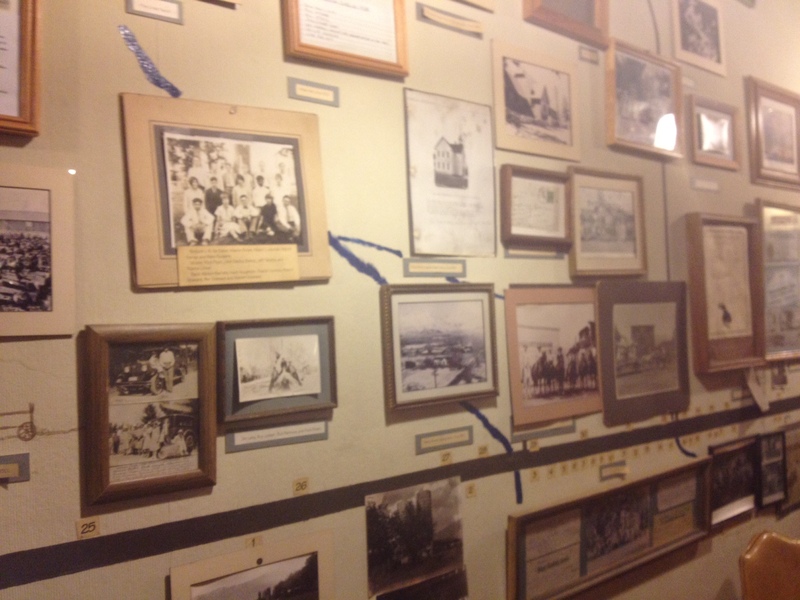 This wall commemorated the small town’s history, with photos, newspaper clippings, and other artifacts from the early 1900s and beyond. 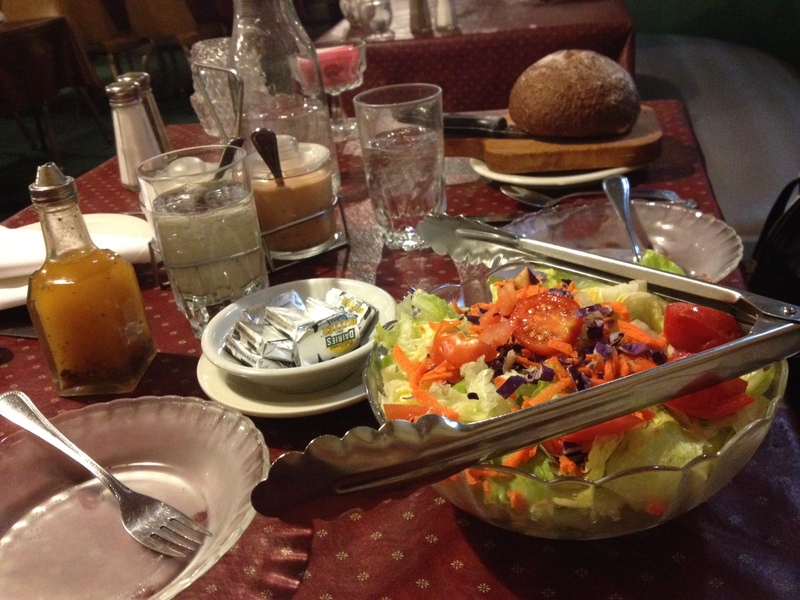 Within moments, our friendly waitress returned with a cart piled high with salad , dressings, and bread. The Italian, Bleu Cheese, and Thousand Island were all made in house. “Enjoy those tomatoes,” she told us, “they’re the last of the season. 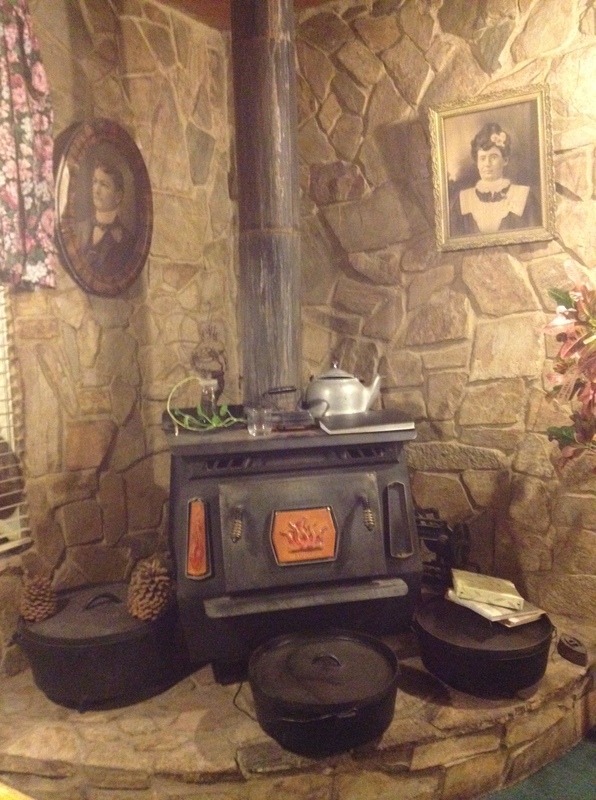 I just yanked the plants out out back.” I mean, really, could the place get any more endearing? 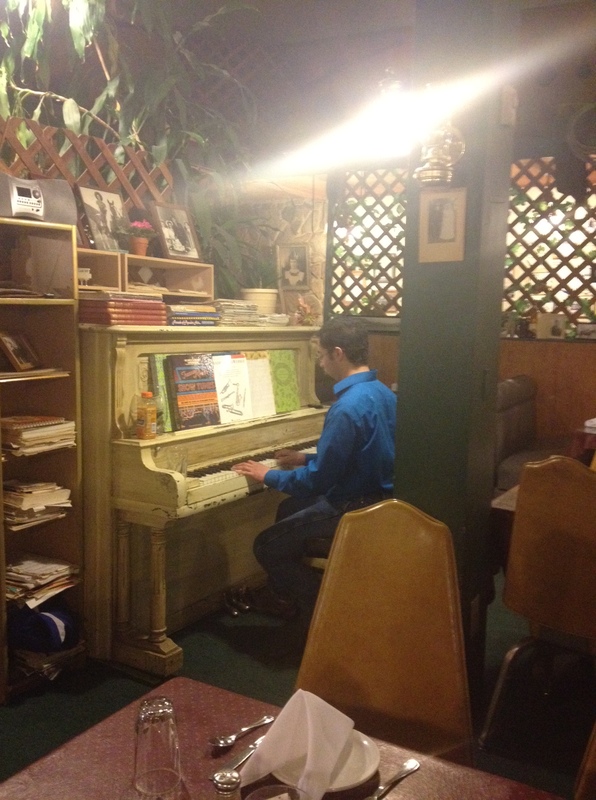 There was even a young man playing the piano while we dined. My spaghetti and meatballs tasted like something straight out of my own kitchen and I gobbled them up. When we asked for the check, the waitress looked shocked that we didn’t want ice cream. “Are you sure?” she asked, “it’s spumoni!” We kindly declined. When she returned with the tab, she asked us again, “and you’re sure you don’t want any ice cream? It’s included with the meal!” I think it literally blew her mind that anyone would turn down free ice cream. “Thanks,” I said, “but we’re watching our figures.” Without missing a beat, she replied, “I bet a lot of folks would like to watch yours!” I couldn’t help myself but laugh and thank her. That home-style meal was definitely the highlight of the trip. Another four hours and some-odd minutes later, we pulled into Lake Tahoe. There were patches of snow on the ground, and my flip-flop clad toes were freezing! Luckily, a friend’s parents have a timeshare here so we’re sharing a nice little suite. He greeted us at the door and we all shared a late-night snack while unwinding from the long day on the road. It felt so good to crawl into bed at the end of the evening. Today the real fun starts over at the casino. We’re here for a World Series of Poker circuit event. In just a few hours, it’ll be Shuffle Up and Deal! This entry was posted in Travel and tagged Road Trip, Travel. Bookmark the permalink. Mmmm! 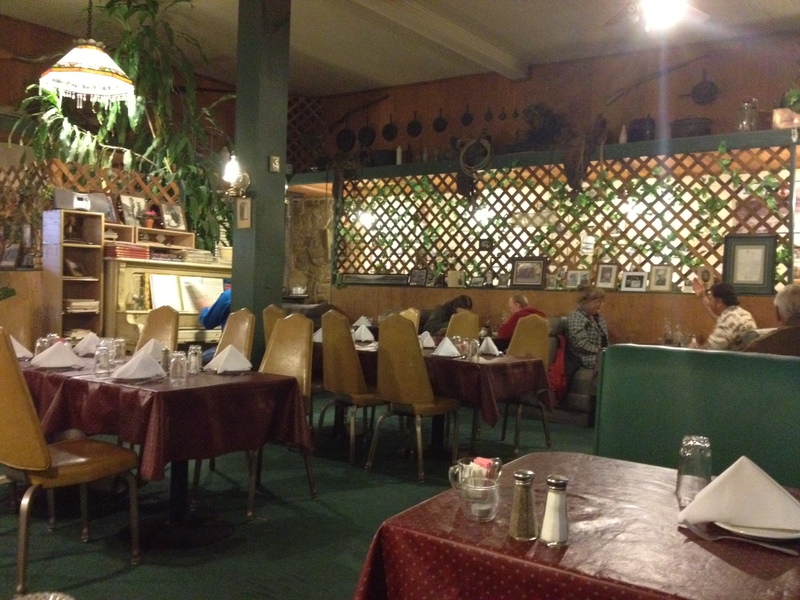 I love little mom and pop places like this. Sometimes they always end up having the best food. I love Lake Tahoe, I hope you have a great trip. I was totally turning my nose up when I walked in (what do you mean they don’t have valet!?) but I walked out feeling like I’d just visited my grandma. It was the best! LOL, how adorable! Isn’t it great to eat at non-chain restaurants that have personality?! what a fun roadtrip!!! xO! 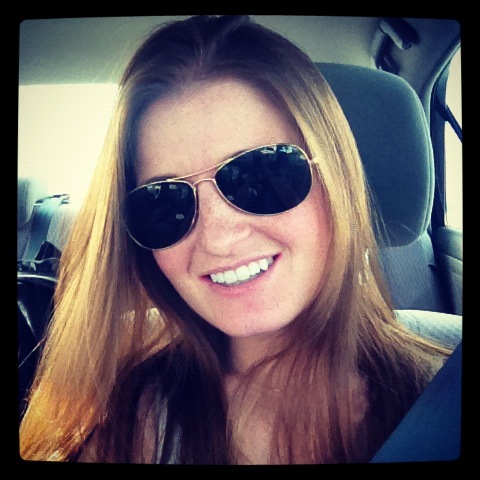 I love road trips and I’ve always wanted to go to Lake Tahoe! I’ve heard Northern CA is completely different from Southern CA, which is the only part of the state I’ve ever been to. Hope you have a great time! So far the biggest difference is the temperature!!! It’s so cold here! But I think the people are known for being different, too. Living in downtown San Diego, most people I know are transplants so I can’t really say what Southern Californians are like. This post is so cute! I’m planning a road trip down south with a few friends for next summer and this just made me so excited for it. I can’t wait to pop into little places like this! How fun! As close as Tahoe is (about an hour), I don’t make it very often. Also, my drive to Tahoe looks much more different than yours does. We drive through lush greens. California certainly is the land of plenty! It’s crazy how big and diverse it is! We basically did the West coast equivalent of Georgia to DC but never left CA! While on the road, I actually commented how cool it was that, in Europe, we could have covered 3 countries in that distance but here we never left our home state! I would LOVE to go to that place with my love! I love road trips!